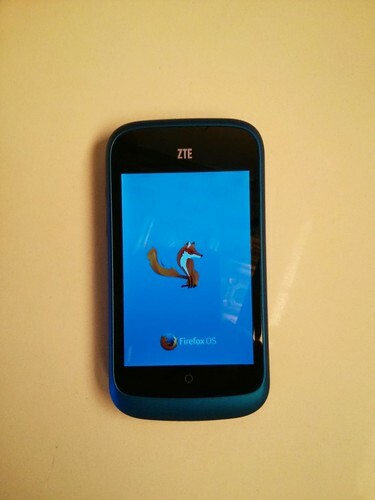 Firefox OS devices officially released! Almost two years ago, we announced Boot to Gecko (B2G) here on Mozilla Hacks. We discussed the aims of the project and the work we were planning to do. Today, all that work has paid off and we now have official Firefox OS devices in store! 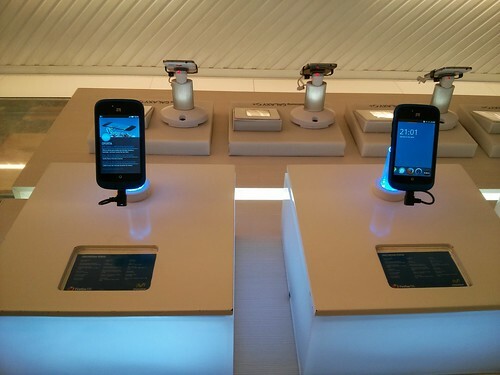 Last week the first Firefox OS phones went out in stores in Madrid, Spain, for sale by Telefónica. These phones are a great example of a low-cost telephone built on Open Web Technologies. It means that if you haven’t gotten started at looking how to build your apps or your content with HTML5 and Responsive Design, now is the time, to have the chance to be among the early options in a brand new market. Telefonica’s launch in Spain was the first for Firefox OS, but Poland, Colombia and Venezuela also have upcoming launches soon. It doesn’t stop there, though, look out for more countries coming soon. Firefox OS runs the web and has a web browser, but if you want to offer an app-like experience, get access to more hardware and APIs and more, building an Open Web App could be a perfect option for you. 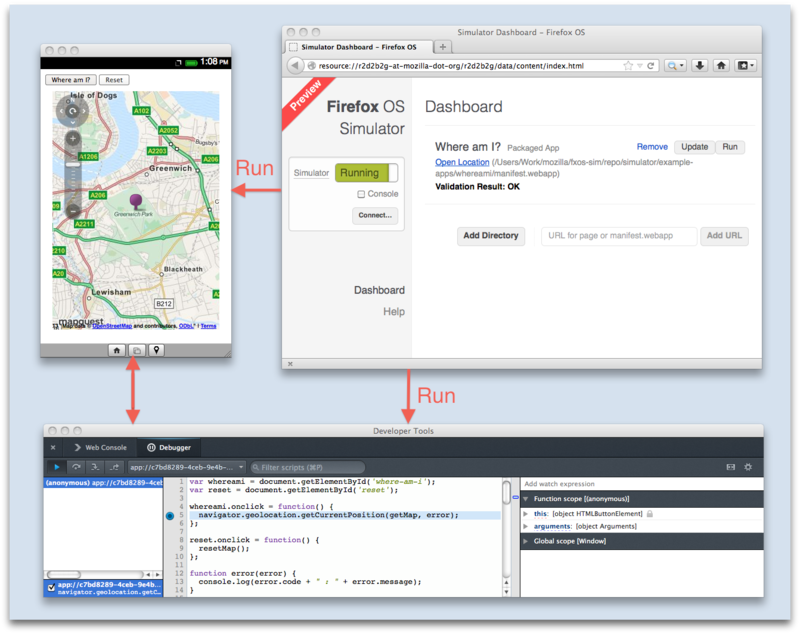 Tool-wise, we believe the Firefox OS Simulator is a great option to quickly test your apps. As part of the Firefox OS offering, we have the Firefox Marketplace, where you can upload and share your apps. We are also happy to say that if you are interested in accepting payments for your app, this is the place! They are described in the Payments page as part of the Developer Hub aimed at app developers, and we’ve also written about them here before in Building A Paid App For Firefox OS. All in all, Firefox OS is here available on released devices, and we hope the capabilities for you as an Open Web Developer to offer good content and experiences sound good. We are continuously working on making the options and possibilities as good as we can for you! Nice. Is there a possibilty for developers who did not receive a developer phone to order a Firefox OS Phone somewhere online? Right now phones are only offered in the markets where they are for sale, but I personally hope we will be able to offer more developer phones, no matter where you are, in the future. It woud be nice a “pay as you want” payment option… That would be an easy way to support projects we like. It would be an interesting approach, but with operators and hardware partners and a lot of investments, some costs need to be covered in such a venture. I think Gorhoa meant “pay what you want for apps”, like the humble bundle or other softwares. This is common in certain software circle, and it could be a good thing to further give a specificity to the Firefox app store. free / fixed price are of course the base, but variable pricing would be a very open way to price apps. If that’s the case, sure. These are the first steps with payments in the Firefox Marketplace, and we’ll definitely consider more options in the future. Sounds good, hope you get the chance! With the Zte Open, the wifi connects only once to a network. If you switch to your carrier’s data and switch back to your wifi, it does not connect anymore. The reset of the phone does not resolve the issue, adb ‘rm /data/…wifi file’ either (permission denied, adb root provokes ‘can not run as root in production mode’). It’s a shame. It makes it the worst smartphone ever for now. I personally own one and have tried what you described, and both options still work for me. I believe the best thing is to get in touch with Firefox OS support and hopefully then can help you. Please, look at http://www.fairphone.com/ for collaboration or ideas if you haven’t already. Thanks for the tip! We always explore a number of ideas and options. No comments? odd. Awesome work guys! I think you guys do such a great work. Will it be as sluggish and resource-hungry as the Firefox browser? Hint: rhetorical question. No one cares. Thanks for your opinion. Given the massive interest in Firefox OS in general, I’m not sure I’d agree that no one cares, though. 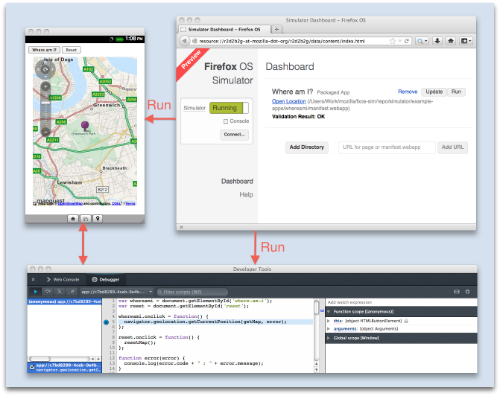 The Gaia and B2G teams have gone to incredible lengths to make sure that Firefox OS is as speedy as possible. It is great to have more OPEN SOURCE alternatives in mobile world! Excited to test first FF OS on a smartphone! Thanks! And yes, we believe the mobile world really needs this option. Today I am a proud Telefonica stockholder! Great to see it materialize :) Congratulations, keep it up. Thanks! And I hear you. Our initial goals are a number of emerging markets, but for people living elsewhere, I hope we will be able to offer more developer phones over time. Who cares. Firefox is dead and this is another silly attempt that’s just a big waste of time. Thanks for your feedback. Like AndroidUser says, we believe competition and options are vital for a thriving mobile world, and that it helps the speed of evolution and improvements. Just like it has in the web browser field. I know you are probably just trolling, but I think firefox is now coming back to life. It lost direction for a while but with the last releases, speed improvements, great features (3d and webrtc) and now the Phone OS, I must say they are looking great. However this overshadows the one great difference between Mozilla (Firefox / Firefox OS) and Google (Android / Chrome) – Open Standards and respect for privacy. Thank you! And yes, it will very soon be available in Poland. Off the top of my head, I believe the version on the released phones is the same as the latest on the Peaks and Keons from Geeksphone. If you have a developer phone, I also recommend taking a look at the Updating and Tweaking your Firefox OS Developer Preview phone/Geeksphone article. Great work guys! Looking fwd to use one. Thank you, and I hope you get the chance! @John: By that logic, since we’ve already been to space, we shouldn’t bother with space research or exploration anymore. Don’t be critical of the people involved in this project. If everyone took your view there wouldn’t be any competition. People said the same thing about the feature gap between Android and iOS when Android 1.5 came out, but look at the mobile industry now. Great job, Mozilla Team! Can’t wait to get my hands on one of these. Thank you, hope you get the chance! So….just to be a 12 year old boy for a second – does anyone other than me look at the new animated logo and immediately see a farting fox? When the logo popped up in my browser the the other day, that was my first impression. Love Mozilla and Firefox, but that logo…. Well, it’s all in the eye of the beholder… :-) Thanks for the feedback! I want to contribute my skills to Mozilla OS can you please guide me. Good to hear. It depends what you want to do, of course, but I recommend initially to get in contact with Mozilla Reps.
Also see the Get Involved page for lots of ways to contribute. Oh great!…Did Cook sleep last night :-) ? Sounds good, and I hope you get the chance to get a phone eventually. Can you please tell when it will be available in India Or how I can get the phone ? I want to get my hand dirty on firefox os as soon as possible. Thanks a lot for quick relply .You guys are amazing . Keep it up . Not sure when it could potentially be available in India. Getting one through Geeksphone is an option, but I believe they are currently sold out. I got one Keon after many early attempts. Now with latest OS updates, its becoming my personal phone replacing the current Android one. I used to make financial web apps for other smartphones. Porting them to firefox OS was only matter adding a manifest file and minor CSS tweeks. I really appreciate the simplicity of the phone. Good job Mozillians. Keep it going. That sounds great! Thanks for sharing, and I hope you continue to feel good about it! When shall Firefox phones be available in TX, US? There are no plans for the US just yet, but looking into next year, it’s a possibility. There are some builds for other hardware than the Firefox OS devices, but just a fair warning, most of them don’t work completely due to drivers etc. Nice work! glad to see Firefox (and Mozilla) continue to innovate! Some questions (apologies if this is not the right forum): how is the update process for FirefoxOS in this device? patches will be provided? is it locked, or I can I ‘flash it’ with a custom version of FirefoxOS? I believe the update process in general will be pushed over the air to device owners, meaning fixes, new versions and more. With the locking part, I think that will come down to which device and operator it is. wow, that will rock the world. The potential for HTML5 Apps is just enormous. Thanks also for the great links – very helpful; I will spread them amongst our developers. Is it true, that the ZTE only costs EUR 69 with no monthly payment obligations? Thanks! And yes, in Spain the price has been €69, but this will be dependent on market. you could have used a mtk* series processor and ram, and this would be price competitive at mainstream level. you could also use MIPS based proc and higher ram and the response would still be great given the price points. just my 2 cents.